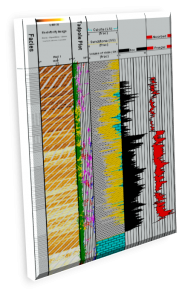 Downhole images are acquired by utilising variation in petrophysical rock properties and the interpretation of the images relates them to a geological response. Any one image reflects only one property, e.g. resistivity in most cases. However, one petrophysical log cannot sufficiently describe the complexity of a rock and if possible, multiple logs responses are used to characterise e.g. lithologies, fractures, cementation or pore fill. For wells with no image log and little core information the geological interpretation of the petrophysical logs may be useful, applying the electrofacies concept. An electrofacies is defined by an individual set of log responses which define one lithology and each lithology has to differ from others by at least one parameter. Again, the greater the diversity of log measurements the better the characterisation and the less ambiguous the interpretation. The translation of log responses to a lithofacies is also influenced by well condition, porosity or lithification. Also, the nature of the log curve can indicate trends which may be related e.g. to fining upwards or coarsening upwards sequences or repetition due to faulting. For further information on petrophysical services, please click here.